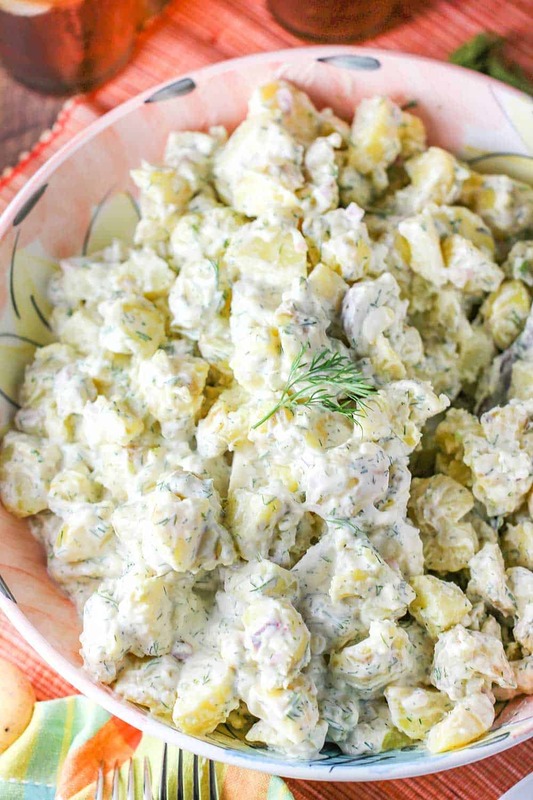 Best-Ever Potato Salad is so refreshing and the perfect side dish! 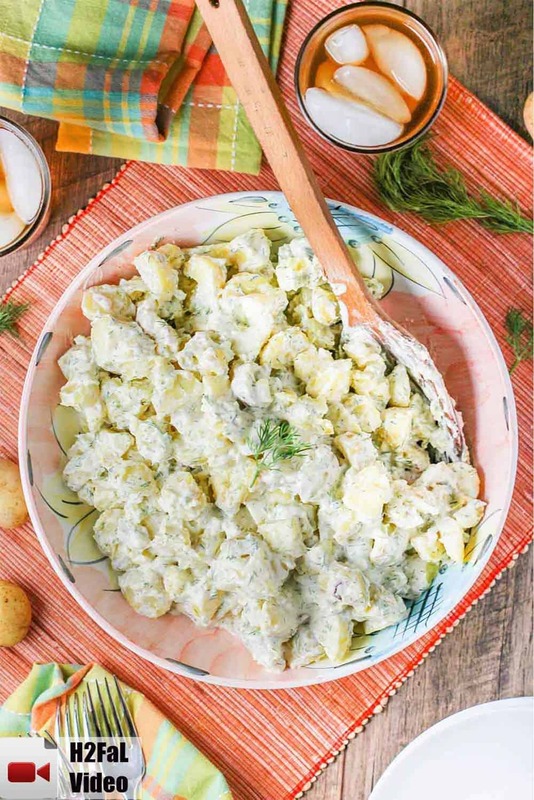 This potato salad is creamy without being to ladled with mayonnaise. The dill, fresh lemon, and Dijon brighten the dressing perfectly. 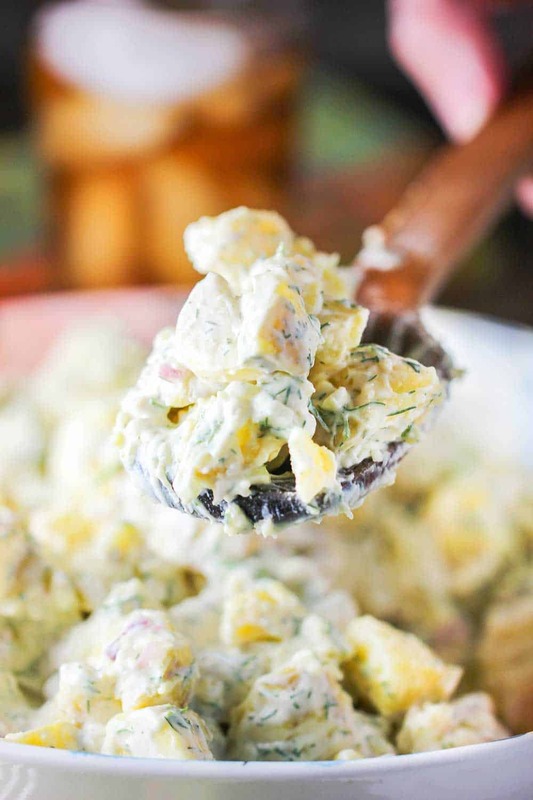 We love this Best-Ever Potato Salad and so will you! Making the best-ever potato salad at home is a snap. 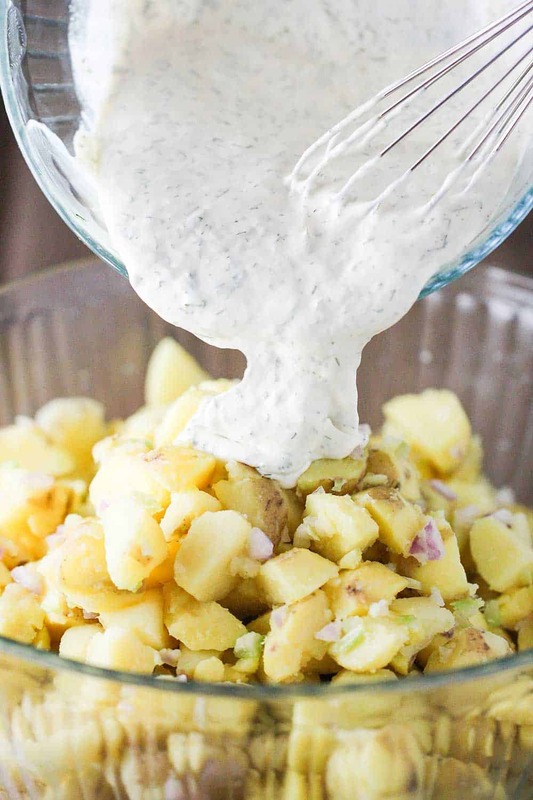 Watch us show you how simple it is to make this wonderfully delicious potato salad! What makes this potato salad so special? Simple, fresh ingredients. We love the texture of Yukon gold potatoes. Small potatoes are perfect for halving and then boiling, but they can be time-consuming to peel. We typically opt for medium sized potatoes that we peel and then cube into bite-size pieces. We find that dumping the freshly-cooked potatoes directly onto the diced celery and onion cooks the veggies just enough to soften them. This also imparts flavor into the potatoes. The taste is subtle, but so nice. Now, what really makes this the best-ever potato salad is the dressing. Make your own homemade mayonnaise, or go with a good-quality brand. 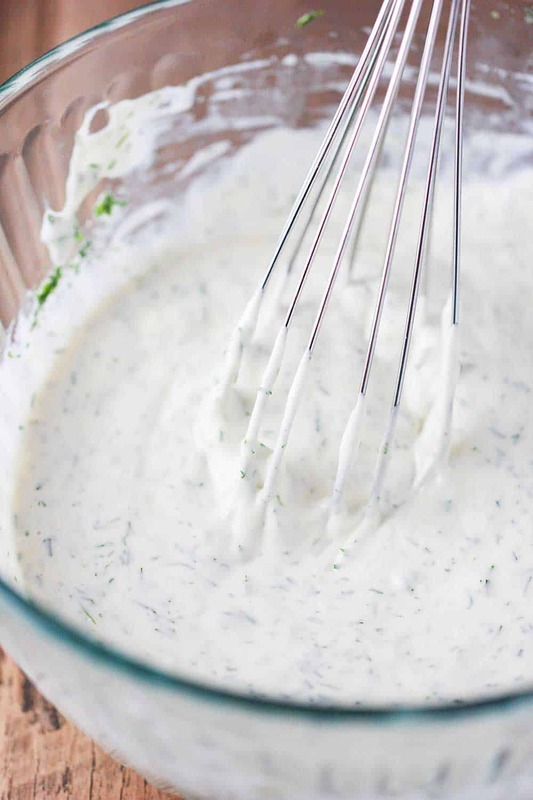 The addition of white wine vinegar, lemon juice, and fresh dill makes the dressing fresh and just sublime. 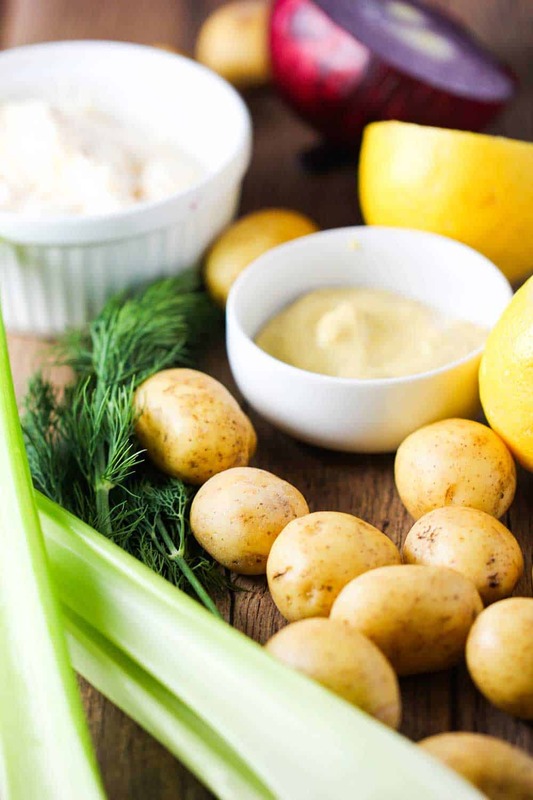 We feel strongly that the best potato salad should not be swimming in a mayonnaise-laden sauce. The potatoes should still be the star and the dressing just brings them to life. As the potato salad rests, the spuds will absorb some of the dressing, which is good. We find that once the dressing has fully coated the potatoes, you can simply cover with plastic wrap and then serve within a couple of hours. Alternatively, you can absolutely place the prepared salad in the refrigerator and let rest for 8 to 12 hours, or overnight. This is awesome, too, as the flavors really meld! If you place in the fridge, we recommend you set the salad out until it comes to room temperature for a couple of hours, and then give the salad a few good turns with a wooden spoon. Either freshly made or made a day in advance, it’s still the Best-Ever Potato Salad! We find that the dressing is more creamy when the salad is at room temperature. If you are serving outside on a hot day, place the bowl of potato salad on a dish filled with ice. Once you and your family and friends try this potato salad, you’ll understand why it’s called BEST-EVER! It’s really that good! 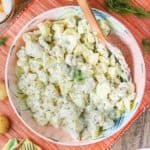 This Best-Ever Potato Salad is really so delicious and is just the perfect side-dish for a BBQ or picnic. You can make this a couple of hours in advance and serve as is. You can also place in the fridge and chill for up to 12 hours. Just let is come back to room temp and then stir. Either way, it's always a crowd-pleaser and so delicious! Place the potatoes in a big pot with enough water to cover by 1-inch. Season liberally with salt and bring to a boil. Cook until the potatoes are just tender when pierced, about 5 to 6 minutes. Once a knife can easily pierce one of the potato pieces, they are ready. Don't overcook! Place the chopped celery and onion in the bottom of a large bowl. Add the hot potatoes and stir with a large wooden spoon until fully combined. To facilitate cooling, spread the potatoes out onto a large baking sheet. Meanwhile, in a medium bowl, mix together the mayonnaise, Dijon, 1 tsp salt, a pinch of black pepper, vinegar, lemon juice, and dill. Whisk until fully combined. 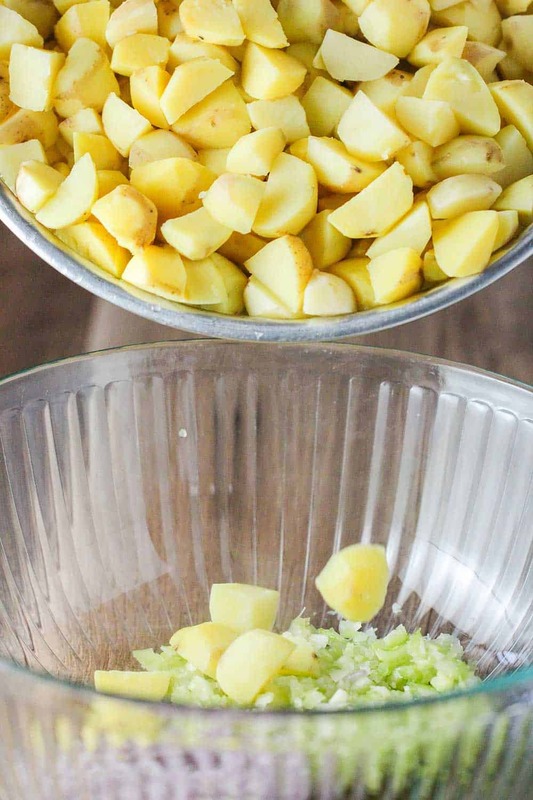 Return the cooled potatoes with celery and onion into the large serving bowl. Pour the dressing over the potatoes and gently stir with wooden spoon until the spuds are fully coated. Cover with plastic wrap. 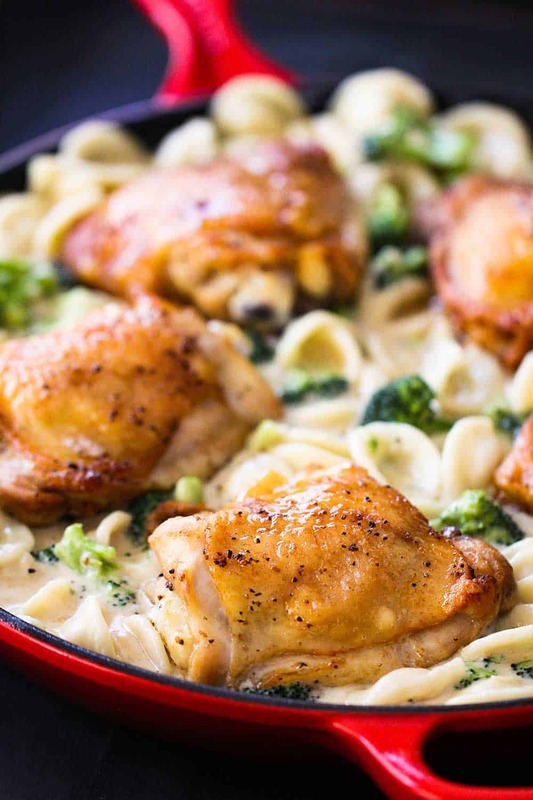 Serve within 2 hours at room temperature. Or, refrigerate for up to 12 hours, or overnight. Best if allowed to return to room temperature before serving. Give the salad a few good mixes with the wooden spoon. Garnish with a nice sprig of dill.